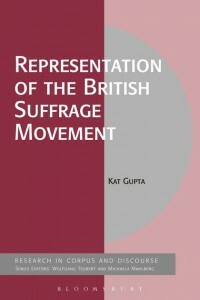 My monograph, Representation of the British Suffrage Movement was published by Bloomsbury in November 2015 as part of the Corpus and Discourse series. Focussing on The Times, this monograph uses corpus linguistics to examine how suffrage campaigners’ different ideologies were conflated in the newspaper over a crucial time period for the movement – 1908 to 1914, leading up to the Representation of the People Act in 1918. 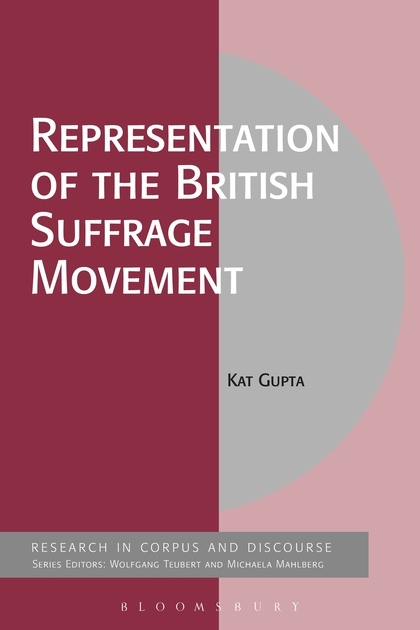 Looking particularly at representations of suffrage campaigners’ support of or opposition to military action, Gupta uses a range of methodological approaches drawn from corpus linguistics, discourse analysis and CDA. These include: collocation analysis, examination of consistent significant collocates and van Leeuwen’s taxonomy of social actors. The book offers an innovative insight into contemporary public understanding of the suffrage campaign with implications for researchers examining large, complex protest movements. Links to reviews will be provided when they’re published.